As I’m writing up my PhD dissertation, I am continuously striving to streamline my writing process and simplify my writing environment. For this reason I have been drawn to minimalist writing applications that reduce unnecessary distractions, such as too much chrome and colourful menu buttons in applications. I use different software for different writing situations. Currently I am writing up a chapter for which I have detailed notes organised in an elaborate Freeplane mind map, which I keep in my right hand monitor. My central monitor is where I do the actual writing. 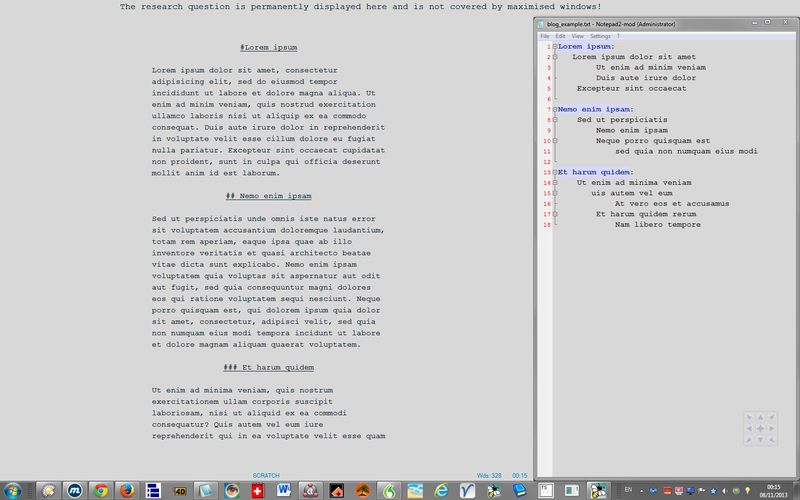 Currently, this consists of a WriteMonkey window that takes up most of the left and centre of the monitor area, while on the right I have a Notepad2-mod window open to take some ad hoc notes and organise them into a quick outline prior to writing. To do the actual writing, I use Dragon NaturallySpeaking to dictate directly into WriteMonkey, while looking at my Freeplane mind map, which I check off gradually, as described in this post. Notepad2-mod is a recent discovery for me. It is a replacement for Windows’ own Notepad. I have learnt about it at the Donation Coder forum, where you can find instructions on how to turn it into a very simple plain-text-based outliner. I like to use it in conjunction with WriteMonkey, as it is easy to copy and paste unformatted text from one to the other, and I also find it distraction-free enough. I also use Notepad2-mod as a scratch pad area, to work out ideas quickly, before dictating them into WriteMonkey. There’s one more screen element that has become an important part of my setup. As I was writing my chapters, I continually wished that I was able to view my main research question at the top of my screen, so that I would be reminded of it at all times, in order not to lose my main focus. However, I had a hard time finding a solution that would display a single line permanently at the top of my screen, without there being any chrome around it, and without it being obscured by maximised windows. Eventually it was another of Mouser’s brilliant little solutions that allowed me to do this. It is a very simple little application called DesktopCoral, which lets you reserve an area of your screen and prevent other software from covering it. Besides other uses, you can also select a .jpg image file to be displayed within it. So all I had to do was to take a screenshot (using Mouser’s excellent Screenshot Captor) of my research question displayed in a single line in WriteMonkey, and insert it into DesktopCoral’s docking bar, which I docked to the top of my screen. It takes up just a tiny sliver of it. As you can see (exactly because you cannot actually see it!) from the screenshot below, the DesktopCoral bar blends into my screen environment seamlessly. If I did not need the Notepad2-mod window, then I could just centre WriteMonkey in full-screen mode (again, with Winsplit, in order not to obscure the DesktopCoral bar), and the research question area at the top would simply look like it belongs to WriteMonkey itself, except that it is permanently there, and it does not disappear when I scroll up or down, or indeed do anything else: it remains visible even when I close WriteMonkey and switch to other tasks. At the moment nothing is more important to me than remaining mindful of my research question, therefore I do not mind at all that it is always in my face. I could imagine that other people might find this solution useful for pinning important reminders—or even inspirational quotes—to the top of their desktops to permanently remind them what is important. The most amazing thing is that, with the exception of Dragon, all of the above tools are free– though their developers do welcome donations, and they deserve them, too. I just love these tools to bits—or should I say, to bytes? I have recently updated my Dragon NaturallySpeaking to the latest version of 12.5. 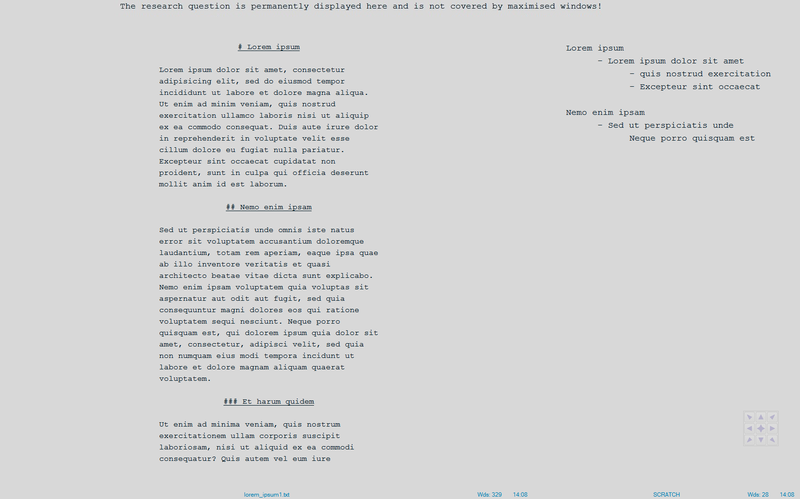 Currently I am using it mainly with WriteMonkey, as I like to write in a minimalist environment. But while I was playing around with Dragon today, I realised that it is also possible to dictate directly into ConnectedText (or any other software not directly supported by Dragon), if you permanently turn off the Dragon Dictation Box feature that pops up. This might mean that not all of Dragon’s features will work in those unsupported software, but I only ever use dictation anyway.